Shingle Roof Installations and Repairs from Award-Winning GAF Master Elite Roofing Contractor - CertainTeed Select Shingle Master Contractor. GAF Roofing offers many styles of Architectural Roofing Shingles to meet every budget and aesthetic consideration from the Premium Lifetime Designer Roofing Shingles, which emulate the look of slate or wood shake roofs, to the popular Timberline® Lifetime Architectural Roofing Shingles Series featuring color blends and shadow effects for a dimensional look. GAF Roofing Shingles are Class A fire-rated and designed with GAF’s Advanced Protection® Technology, which minimizes the use of natural resources while providing superior protection for your home. GAF Shingle Roof systems available in the San Francisco Bay Area, including Marin County, San Francisco Sonoma County and Napa are the Glenwood™, Grand Canyon®, Timberline HD®, Timberline UltraHD®, Timberline® American Harvest®, Timberline Natural Shadow®, Timberline® HD Reflector Series, and the DecoTech™ Roof Integrated Solar System. Only 3% of roofing contractors nation wide posses the professional roofing qualifications and proven commitment to superior roofing standards required to earn GAF’s premier accreditation. As an award-winning GAF Master Elite® Roofing Contractor serving Marin County, Sonoma County, San Francisco and Napa, our roof installations meet the highest quality standards to qualify for GAF’s enhanced roof warranties. This includes GAF’s Golden Pledge® Warranty, which guarantees our workmanship on the GAF Lifetime Roofing System for 25-years backed by GAF’s financial clout as North America’s largest roofing manufacturer. GAF Select Solar Contractor with certified installaton expertise of the GAF DecoTech™ Integrated Solar Roof System. Certified GAF Green Roofing Contractor offering Eco Roofing Services. CertainTeed Roofing offers a wide array of residential roofing shingles that are as beautiful as they are durable. From the Presidential Shake™ with the look of wood shakes, to the Grand Manor™ with deep shadow lines replicating the look of slate roofs, to the scallop edged Carriage House™, to the classic dimensions of the Landmark shingle™ and the solar reflective Solaris® - CertainTeed Shingles offer the enhanced aesthetic appeal you want with the durability you need. Qualifying as a Select ShingleMaster™ Roofing Contractor places Wedge Roofing in the top 1% of the roofing profession. Having met the stringent requirements to earn CertainTeed's premier roofing credential represents an endorsement of excellence in our workmanship, customer satisfaction and ethical business operation. 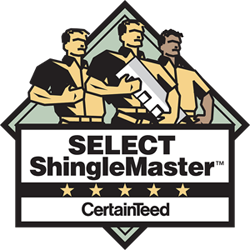 Our Select ShingleMaster™ status assures your new CertainTeed Shingle Roof meets the highest quality specifications to qualify for CertainTeed’s strongest extended warranty coverage. Including the Sure Start Plus™ 5-star coverage, which guarantees our Integrity Roof System™ installation for 25-years. IKO Shingle Roof Systems combine beauty with contemporary strength. Manufactured in a larger size exclusively for the Western United States to offer more exposure and create a high definition look for your roof, these popular roof shingles are versatile and easy to maintain and come in a myriad of colors and styles that can suit any home or business. Wedge Roofing combines 42 years of shingle roofing installation knowledge with the beauty and durability of the IKO selection of shingle roof systems. As a certified IKO Shield Pro-Plus Roofing Contractor our IKO roof installations qualify for the manufacturer's best warranties. GAF's Timberline® HD Reflector Series, CertainTeed Presidential Solaris™ and Landmark Solaris™ meet ENERGY STAR® standards for solar reflectance and thermal emissivity and are rated by the Cool Roof Rating Council (CRRC) for Cool Roofs meeting California’s Title 24 requirements. The Novato building inspector told my neighbor, “If Wedge did the roof, then it’s done right!"